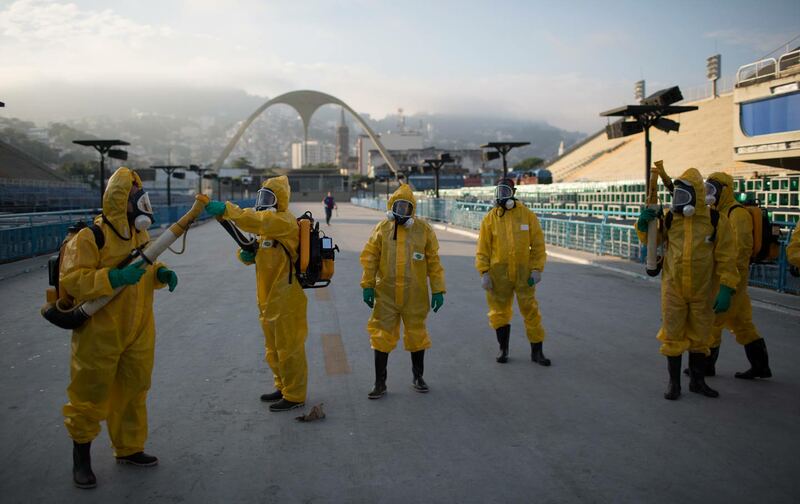 Whether the failure of the World Health Organization (WHO) to recommend delaying the Rio Olympics will go down in history as a deadly misstep, expanding the global Zika pandemic, remains to be seen. But even if it doesn’t—and if athletes sidestep the pathogens teeming in the polluted Guanabara Bay, rich with untreated sewage, trash, and industrial waste—the Olympic Games in Rio as elsewhere will exact a significant toll on public health. According to the Centers for Disease Control (CDC), which pointedly recommended that travelers consider delaying journeys to Zika-afflicted areas, the Games could spread Zika to some of the poorest and most remote countries in the world. And yet, just months after dubbing the Zika outbreak a public-health emergency of international concern, the WHO refused to heed calls from scores of public-health experts to recommend delaying or relocating the Games, allowing hundreds of thousands of people from all over the world to flock to the epicenter of an expanding global pandemic of a poorly understood, untreatable virus. Mass sporting events have been postponed or relocated to prevent the spread of disease before. In 2003, FIFA relocated the Women’s World Cup from China to the United States to prevent the spread of SARS. In 2015, Morocco refused to host the African Cup of Nations for fear of the spread of Ebola. In May of this year, Major League Baseball moved a baseball series from Puerto Rico to Miami, citing the risk of Zika. Whether the WHO failed to do the same in Rio because of its faith in the mosquito-depressing effect of Rio’s cooler winter weather, as the agency has stated, or some less savory motive is unclear. Even if athletes sidestep Zika, the Olympic Games in Rio as elsewhere will exact a significant toll on public health. The WHO is the health arm of the United Nations. The International Olympic Committee (IOC), which runs the games, enjoys a collaborative relationship with the UN, raising the specter of a possible conflict of interest. Like humanitarian organizations such as the Red Cross and the Global Fund to Fight AIDS, Tuberculosis and Malaria, the IOC is an observer of the UN General Assembly, and has been collaborating with the WHO since 2010, when the IOC and the WHO signed a memorandum of understanding. In the absence of reliable and coherent public-health advice, spooked Olympics delegations to Rio have taken matters into their own hands. South Korea outfitted its team with special “Zika-proof” uniforms pretreated with insecticides, and Australia provided its team with “Zika-free” condoms spiked with antimicrobial compounds. The US indoor volleyball coach took the time to freeze his Zika-free sperm before getting on a flight to Rio. Meanwhile, some of the top athletes in the world, such as golfers Jason Day and Rory McIlroy, forsook their Olympic dreams and just stayed home, rather than risk the bite of an infected mosquito. If Zika does expand thanks to the Olympics, it won’t be the first pathogen to exploit a mass sporting event. The role of the Olympics and the World Cup in sparking outbreaks may pale in comparison to the massive, unrelenting, and unchecked dissemination of pathogens through commercial air travel, but they’ve facilitated outbreaks nevertheless. A vicious outbreak of influenza during the 1998 Winter Olympics in Nagano, Japan, grounded at least one athlete from every delegation, forcing several top athletes to watch their long-awaited events from the refuge of their beds. Norovirus broke out during the 2006 World Cup in Germany. The 2010 World Cup, held in South Africa during a measles epidemic, ferried the virus into measles-free Argentina. The largest measles outbreak in over a dozen years transpired in British Columbia thanks to the 2010 Winter Olympics in Vancouver, hitting Aboriginal people especially hard. Experts suspect that mass sporting events themselves—either the 2014 World Cup in Rio or an international canoe race—could have brought Zika to Brazil in the first place. But mitigating the risk of outbreaks during mass sporting events is relatively straightforward, if sufficient resources are dedicated to the task. Delaying or relocating sporting events, or stepping up public-health surveillance and interventions while they transpire, can do the trick. Worse is the public-health impact of the economic burden the Olympics places on host cities. Providing security and health services during the Olympics has pushed frayed social services in the state of Rio de Janeiro into “total collapse,” Rio’s governor warned in June. Thanks to the ongoing economic crisis in Brazil, the state has cut its hospital budget by 30 percent, leaving clinicians unpaid and hospitals bereft of basic supplies such as syringes and disinfectants. Fifteen hospitals and clinics in Rio de Janeiro have closed their doors to all patients except those with life-threatening conditions. In those hospitals dedicated for Olympic athletes and visitors, Brazilian patients lie on hallway floors and in beds next to corpses in body bags. The human toll of this breakdown in the health system has yet to be tallied. But one thing seems clear: Should an epidemic erupt, Rio’s hospitals will be hard-pressed to contain it. In host nations with poor human-rights records, the construction of Olympic venues themselves exacts a toll in blood. Thousands of people around the world have been broken and displaced to make way for sparkling new Olympic facilities. Sixty thousand people were displaced to make way for the construction of Olympics venues in Rio. In Beijing, hundreds of thousands were evicted, many without compensation, and those who complained were carted off to prison or labor camps. Not surprisingly, as the UN’s Special Rapporteur on Adequate Housing has documented, such forced evictions expose people to more injuries, higher health care–related expenses, and a range of new chronic health conditions. Women and girls are hit especially hard, as the abrupt loss of homes and livelihoods destroy the social networks they rely upon, exposing them to greater risks of suffering violence. In Sochi, hundreds of undocumented workers died on the job building Olympic venues, their dead bodies outfitted posthumously with safety gear to conceal the neglect that led to their deaths. Road construction destroyed drinking-water wells and blanketed nearby villages with five-inch-thick layers of dust. Five years after construction for the Sochi Olympics, “there’s nowhere left to get water,” one villager unlucky enough to live near Sochi told Human Rights Watch. “We’re all sick,” added another. This isn’t just the result of poor management. It’s a predictable consequence of the way the International Olympic Committee runs the games, offering the ennobling public-relations bonanza of the Olympics to any host nation that promises to bankrupt its public coffers for ever-more-elaborate Olympics extravaganzas. That requires unpleasant human costs. It also requires that those costs be concealed through gags on free speech and the press, leading to further human-rights violations that sicken scores. Brazil passed a “General Law of the Olympics,” which Amnesty International judges “contrary to international law,” restricting freedom of expression and of assembly. In China, similar bans on “negative reporting” during the Beijing Olympics led Chinese authorities to suppress local journalists’ reports that infant formula had been adulterated with melamine, a chemical used in producing plastic. As reporters shelved their investigations so as to not disrupt the uplifting Olympics message, nearly 300,000 infants sickened. Over 50,000 had to be hospitalized. But perhaps the most tragically ironic Olympic legacy lives on in Greece. A devastating economic crisis that continues to this day followed close on the heels of the 2004 Athens Olympics. It wasn’t caused by the Games. But the way the Olympics were managed, facilitated by the IOC, an organization supposedly dedicated to development and human rights, embodied many of the worst distortions that had led to it. To host the games, Greece spent roughly 5 percent of its GDP, building lavish stadiums for obscure sports that locals don’t play, like baseball and field hockey. The economic crisis that followed led to bailouts with crippling conditions—including the requirement that the government slash health spending by 50 percent, causing what a group of concerned Belgian health professionals has called “the most unprecedented and unbearable health crisis to hit the European Union in 70 years.” Infant mortality rose, HIV spiked, and long-tamed scourges like malaria resurfaced. Public hospitals were decimated. Meanwhile, in the parking lots and unmarked roads surrounding Athens’s Olympic hockey and baseball stadiums, thigh-high weeds have sprouted through cracks in the concrete. For years, the stadiums sat derelict. Then, as borders closed across Europe last year, refugees from Afghanistan, Syria, and elsewhere were warehoused in the once-grand venues, staking tents and constructing makeshift lean-tos. The Olympic complex is now a sprawling refugee shantytown. As fans cheer on Team Refugee in Rio, thousands of refugees in Athens’s forgotten Olympic stadiums suffer epidemics of scabies and dysentery. In theory, the games’ riveting celebration of athleticism could save scores of lives, by inspiring its worldwide viewers to exercise. All of this would be objectionable enough if the Olympics were just a global sports spectacle. But they sell themselves as so much more. As one former IOC president put it, the Games promote “education for all, health for all, peace for all, and all human rights for all.” And the WHO and the United Nations, by partnering with the IOC, agrees. So long as that lofty message helps the IOC and its corporate sponsors rake in hundreds of millions of dollars, they should live up to it. Establishing a permanent home for the Olympics would be a good start. That would end the disastrous bidding wars that jack up the price of hosting the games and the bankrupting of public coffers for the construction of white-elephant stadiums. Greece, the birthplace of the ancient Olympics, now shouldering a disproportionate burden of the world’s failure to uphold the rights of refugees, seems like a fitting option.